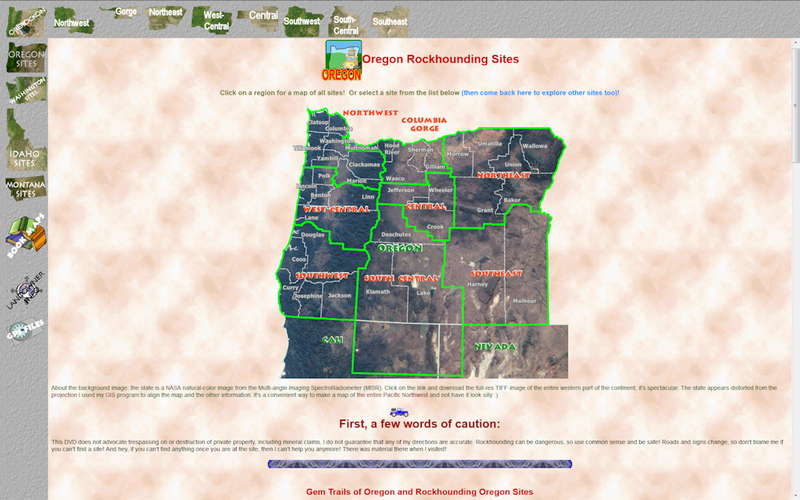 Ore-ROCK-On: Oregon Rockhounds Online Rockhoung field guide, lapidary, obsidian rough and polished specimens and much more! 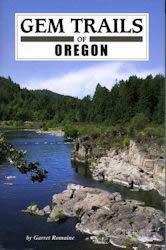 "Orygun, Warshington, Idaho, western Montana and a wee bit o' Cali"
NEW PRICE 25% Off Regular Price! $35.00 for the DVD, plus postage! Add $6.00 for the USB or Micro SD formats. Gem Trails of Oregon by Garret Romaine. 175 waypoints on 105 topo maps for 93 of 99 sites in the book that have rockhounding opportunities. Rockhounding Idaho by Garret Romaine. 196 waypoints on 99 topo maps for 89 of 99 sites in the book that have rockhounding opportunities. Gem Trails of Washington: First edition by Garret Romaine. 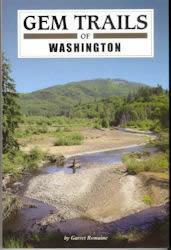 Gem Trails of Washington: brand new second edition (links to the 1st ed. ; coming early 2015!) by Garret Romaine. 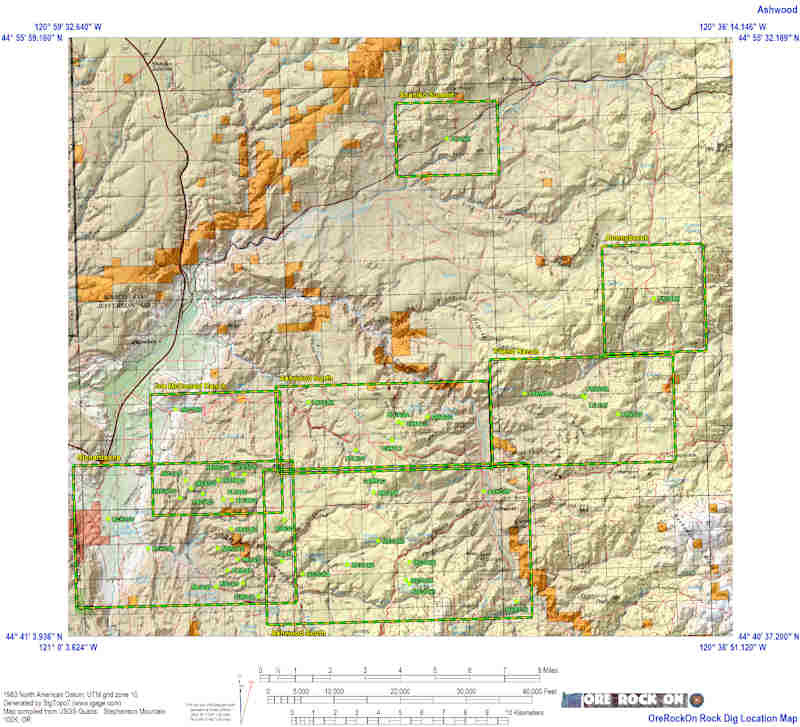 Between the two editions there are now 267 waypoints on 141 topo maps for 72 of 80 sites in the first edition and 95 of 100 sites in the second edition that have rockhounding opportunities. Rockhounding Oregon by Lars Johnson. 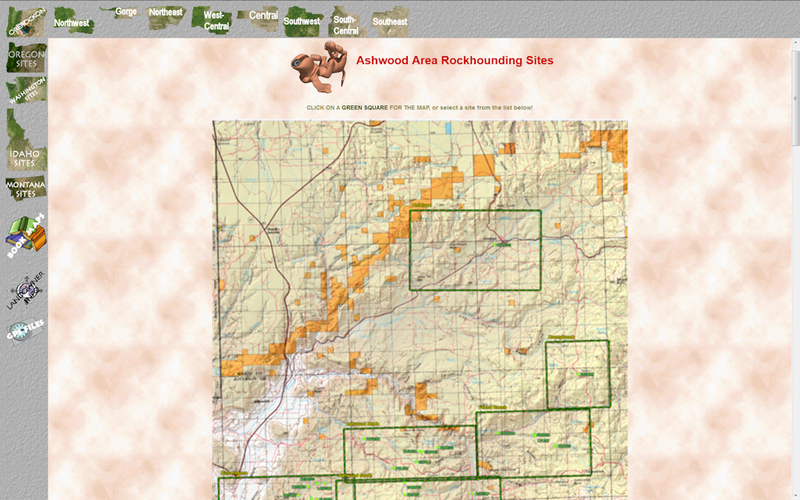 153 waypoints on 96 topo maps for ALL 99 sites in the book that have rockhounding opportunities. Gem Trails of Idaho & Western Montana by Lanny Ream. 132 waypoints on 93 topo maps for 93 of 99 sites in the book that have rockhounding opportunities. Maps for 287 NEW sites detailed 1:24,000 scale collecting area 3D topo maps. All maps have mileposts on all state and US highways (except CA, which doesn't use standard mile markers! Doh!). 884 detailed 1:24,000 scale collecting area 3D topo maps. All maps have mileposts on all state and US highways (except CA, which doesn't use standard mile markers! Doh!). There are maps for 541 sites in the six guide books; 254 sites in the first three books and 287 new sites in the three new books (many, obviously, overlap sites in the first three books). 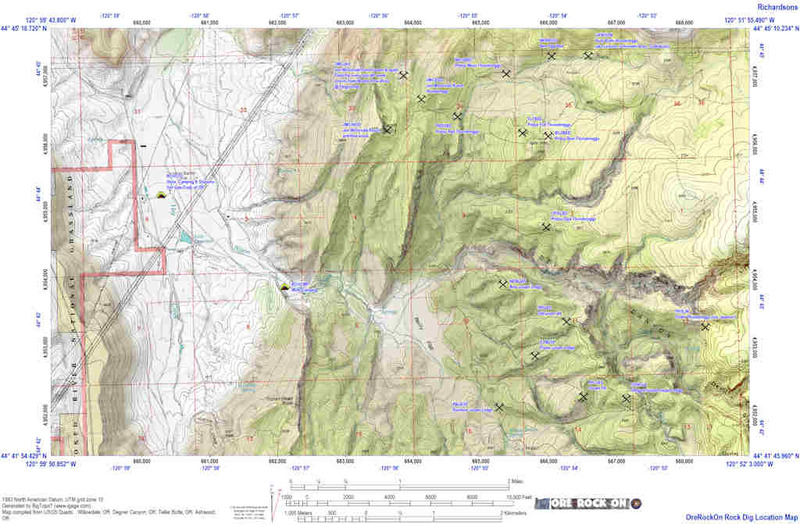 All the overview maps are clickable - you can click on any topo map to view the detailed map! Instructions on printing full size maps, getting waypoints into your GPS, GPS model recommendations. Lists that have all the information describing each waypoint to print out and take with you. A Google Earth file so you can view satellite photos of each dig site or fly from dig to dig in 3D! Plus a few cool bonus features! Now available on USB thumb drive or Micro SD Card (with standard SD card adapter). Great for tablet PCs, IPads, Smartphones! You can stick the MicroSD right into your Smartphone! ATTENTION SDHC CARD CUSTOMERS: I have learned that at some point that Android in their infinite wisdom has stopped supporting SDHC cards formatted the way I have been using since the beginning. Probably with Version 7.1. So IF THE CARD NO LONGER WORKS IN YOUR DEVICE EMAIL ME AND I'LL SEND A FREE REPLACEMENT! Current DVD/CD owners: If you have purchased ANY version of the CD or DVD from me in the past then you can get the DVD V 6.0 for HALF PRICE (before S&H)! Email me at the link at the bottom of the page. Please note: My email address is at the bottom of this page for a good reason, that reason being, if you read the entire contents of this page, and then email me asking a question that is already answered on this page, be prepared for the wrath of the thunderegg gods to come down and cast a blight upon your entire household! Also: If you have a question about "where to go rockhounding" or "where is the best place for (fill in the blank)" (I get these at least once a week), I'll just refer you to the DVD, that's what it's for! 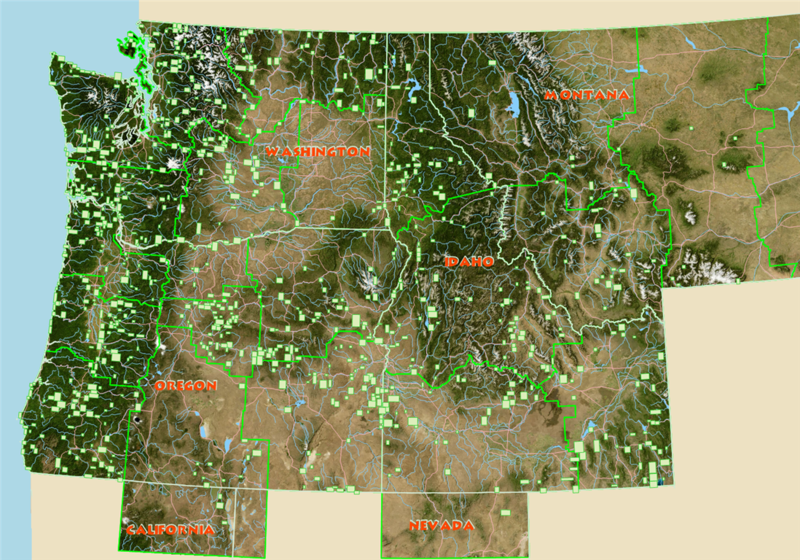 There are online sources for the Pacific Northwest if all you want is a place or two to try out rockhounding or fossil/mineral collecting so I suggest you Google them... or join your local rock club! IF YOU WANT A FREE DVD THE NEXT TIME I ISSUE A NEW VERSION (or to give to a deserving rockhound! ), EMAIL ME SOME PICS AND DESCRIPTIONS OF SITES I HAVEN'T VISITED OR NEW SITES THAT YOU KNOW ABOUT! GPS WAYPOINTS OR SPECIFIC DIRECTIONS NECESSARY! IF YOU DON'T HAVE THE DVD, YOU CAN ALSO SUBMIT SITES AND IF I ADD THEM YOU GET A HALF PRICE DVD! 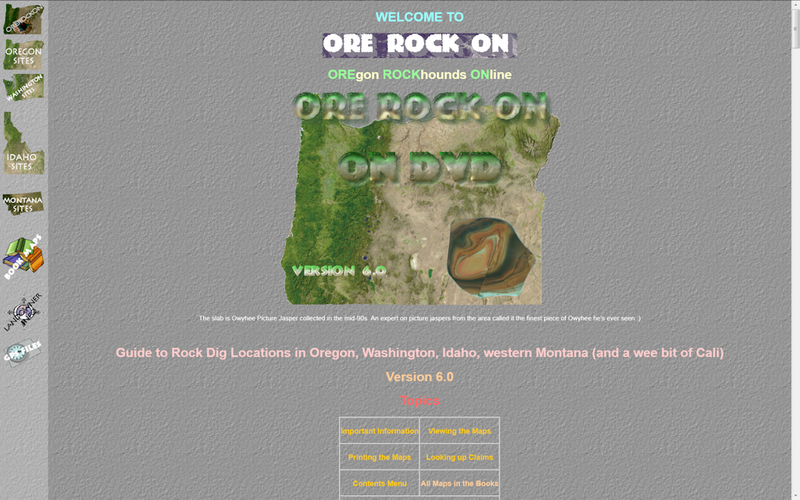 The DVD contains all the rock digs I have visited, plus many, many more, complete with topo maps, directions, and example photos of the rocks, minerals, or fossils available at each site with a write-up (and many others). There are so many sites on the DVD that you can't possibly visit them all unless you have a couple decades of summers to spare! Sites that I haven't personally checked out or have first-hand knowledge of are great places to explore, who knows, maybe you'll be the first to discover something new or rediscover something lost! The DVD also contains files for viewing each waypoint in Google Earth and a waypoint list for downloading to just about any GPS unit (you need to have the software and cable for your GPS unit, or you can easily enter them by hand). I may provide updates of the waypoint file if you have supplied me with a valid email address. 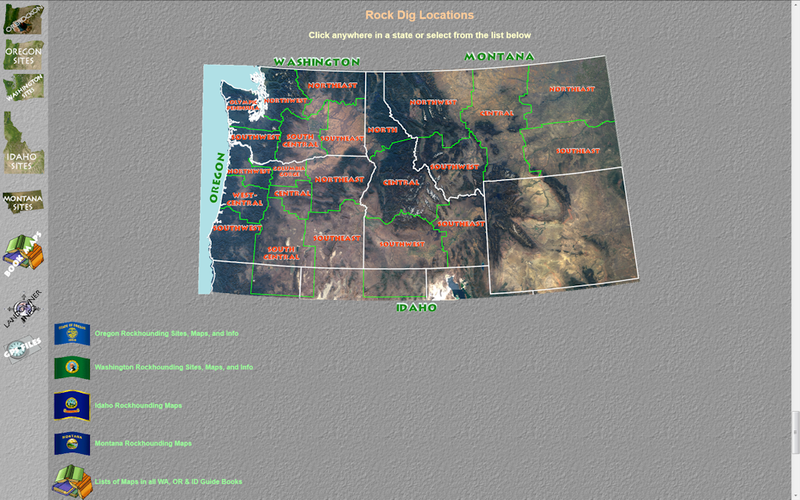 It contains full descriptions of 29 productive rockhounding areas in Oregon and 7 areas in Washington (some Idaho sites are included in the Oregon area write-ups). 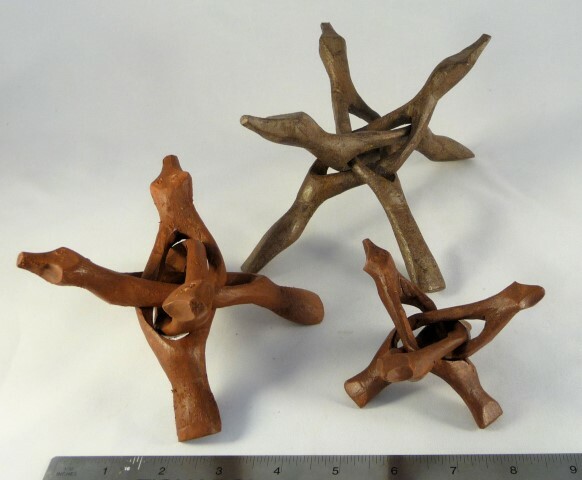 Also example photos of hundreds of materials available at sites that are not included in the detailed write-ups, many of which are from the actual site. I make no warranties about the accuracy of the landowner information. Contacting landowners and finding out what the various state and federal rules for rock digging are is your responsibility! 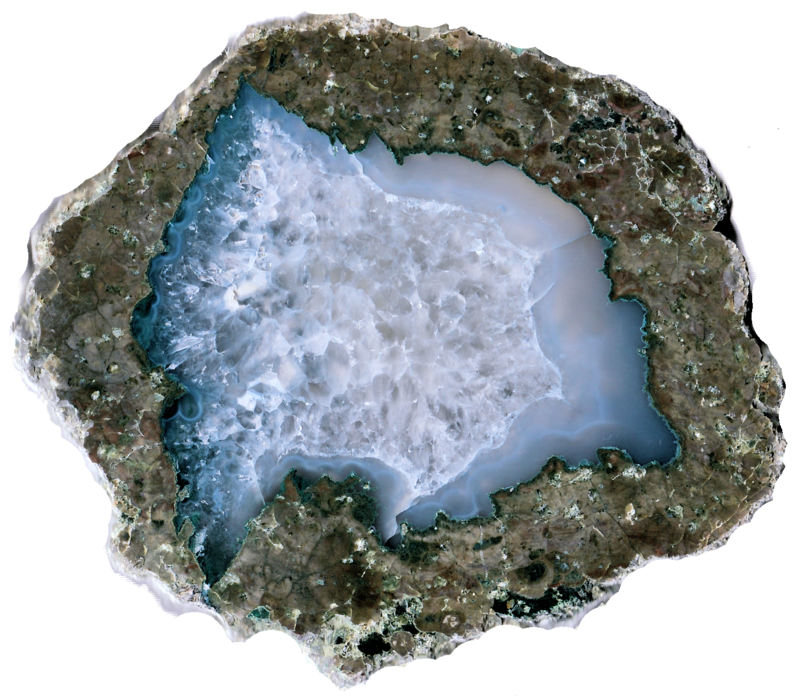 Albite, zeolites, garnet, star garnet, epidote, fluorite, copper minerals, sapphire, calcite, Oregon sunstones!, book mica, beryl, schorl, staurolite, goethite, kyanite, pyrite, corundum, marble, argillite, actinolite, realgar, jordisite, talc, diatomaceous earth (for rock tumbling), feldspar crystals, galena, gold (a few), hematite, nickelite, sillimanite, olivine, malachite, azurite, Josephenite, plus a whole bunch that I can't even pronounce! PLEASE READ BEFORE ORDERING: The DVD will NOT work in a video DVD player! You MUST have a DVD drive on your computer to view the DVD. If you only have a CD drive, you need to install a DVD drive; they are CHEAP. I paid $35 + shipping for the world's fastest DVD Writer in July 2009, so there is no excuse not to buy one! THE DVD WORKS ON ALL NEW MACS. It definitely works on older MAC operating systems, except very old ones. IT WORKS ON ALL WINDOWS BASED PCs, indeed, any OS that supports WWW browsing including Ipads, tablet PCs, Android phones, Iphones, and all sorts of other gadgets. All you need is a web browser and a DVD drive, USB port, or SD card slot. I highly recommend that you have the latest version of your browser installed! See the example Ashwood, Oregon area 1:100,000 scale overview & land ownership map here; this compressed and shrunk image (done deliberately to obscure the juicy bits) is absolutely abysmal compared to the large detailed images on the DVD! See the example Richardson's Ranch 1:24,000 scale collecting area map here; this compressed image is also much lower quality than the images on the DVD! Mac users: I have been informed that for two customers some of the fancier aspects of the DVD didn't work as expected in versions before 5.3. They are limited to clicking on links for overview maps on some of the state region pages that don't lead to the expected map images. You can however access all of the map images by clicking on the appropriate file. Do this by opening the contents of the DVD in the Finder application. I can email you instructions if this happens on your computer. BTW there are excellent (and free) alternatives to the Finder that make it a lot more user-friendly. If you want to exchange the DVD for a new copy (free of charge), please email me. Versions 5.3 forward DO work with all MAC operating systems as of 2017. You DO NOT need a Paypal account to use Paypal, just a credit or debit card!